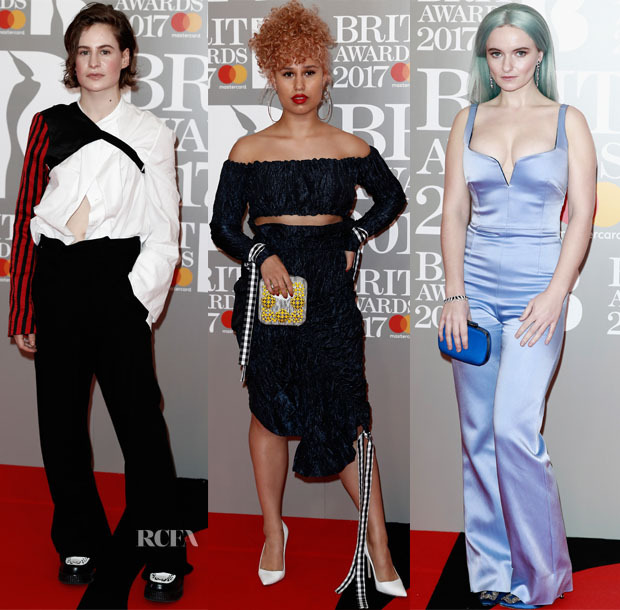 The 2017 BRIT Awards certainly brought no shortage of head-turning looks on Wednesday (February 22) in London, and here are a few more of them. Jesy Nelson: The Little Mix girls were present and accounted for, with the chart-topping British group bringing their distinct stylistic flair to the event—starting with Jesy who played tough-girl-meets-seductress in this leather dress and long locks. Leigh-Anne Pinnock: If this dress were a song, it would be a mashup between the ’80s and the ’90s, with a punk-rock meets grunge beat. That is to say there was a lot going on in this Namilia Spring 2017 denim, cone-bra gown so I’m glad she kept the styling sleek with her updo and minimal jewels. Perrie Edwards: She also had a throwback moment, putting the cone bra to work for her, excepts hers was manifested in a black patent corset bodice with an illusion neckline. The feathery mullet skirt added a note of softness while fully showing off her legs. Jade Thirlwall: Legs, or should we say leg, also dominated Jade’s Rare London white slip gown that looked as if it could have slipped right into a wardrobe malfunction at any moment. Aside from the dangerously gaping dress, it was too long and too creased—and the black gloves further lessened any of my tolerance for it. Did any of these looks pass the test for you? Heloise Letissier: Just as I thought it couldn’t get much more ill-fitting, and then this Ann Demeulemeester Spring 2017 ensemble took to the red carpet. I don’t know what was worse—the gaping, oversized white blouse or the striped arm sling. Raye: This ruched, midriff moment from the House of Holland Spring 2017 collection held promise, but part of me just wanted to clip off those gingham ribbons. Anyone else? Grace Chatto: The Clean Bandits star matched her My Little Pony pastel-teal hair with a lavender Galvan Spring 2016 jumpsuit that suffered from an improper fit, too, and a navy clutch that didn’t make sense. Satiny fabrics are hard enough to wear as it is, even with a perfect fit.